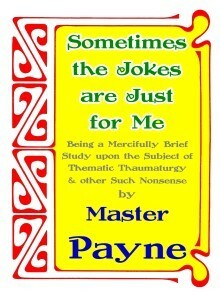 Today, when you order "Sometimes the Jokes are Just for Me by Master Payne", you'll instantly be emailed a Penguin Magic gift certificate. You can spend it on anything you like at Penguin, just like cash. Just complete your order as normal, and within seconds you'll get an email with your gift certificate. A marvelous manuscript of meaningless meanderings on the matter of making magic more meaningful . And, it's fun to read as well. The only magic book we've seen with footnotes. Master Payne has an amusing and engaging writing style. Which he uses to impart the skills one needs in the creation of theme specific shows. Which he refers to as Thematic Thaumaturgy -- the performance and presentation of character driven magic. 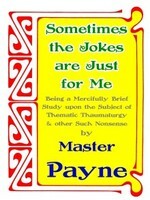 In this book Master Payne teaches by example. He uses routines from many of his shows and demonstrates how, why and what he changed to make these standard magic effects fit into various themes. There is a mediaeval presentation for Tenyo's What’s Next?. As well as period style presentations for the Die Box and the Chinese Sticks that will appeal to Ren Faire workers. Also included is an outstanding version of the Orange Rice Checkers as well as a Multiplying Bottle routine that David Acer has deemed the second best presentation of the effect that he has seen. Also one should not miss Master Payne's signature effect The DaVinci Code Card Trick. In all of these examples Master Payne shares the entire script as this is one of the pivotal ingredients for creating a great themed show. WHERE will you be doing it? WHEN will you be doing it? HOW will you accomplish all of the preceding? The last 30 pages or is a collection of bonus effects. Yet more insight into his offbeat thinking and still more examples of how to create unique and personalized effects. 1st edition 2006; 102 pages. One of the best sets of lecture notes we have seen in years is Master Payne's SOMETIMES THE JOKES ARE JUST FOR ME. The title has nothing to do with the substance of the notes - it is just an example of Payne's quirky wit. We have seen Payne perform twice. He is a fine, fine performer and very funny. He usually performs in character. He might be a Renaissance jongleur or a wizard or a mad scientist. These notes give several examples of how Payne adapted standard tricks to fit his character and shows photos of the props as he refigured and redecorated them to fit his theme. In addition he gives the complete patter for several of his routines, most of them in character. It is a fun, fun read. Even the footnotes (over 100 of them) are fun to read. But, best of all, for anyone looking to branch out into character magic, or as Payne refers to it, "Thematic Thaumaturgy," this is an informative and inspiring primer. There is more than a little wisdom in these pages - good advice on performing, Like Dayton's, Payne's thoughts are reminiscent of Fitzkee, but a lot more fun to read than Fitzkee's and, because of that, I think more meaningful. Stuck in the middle of the book (it should be referred to as a book and not "mere" notes) are 20 pages of sound thought Payne calls, typically, "Totally Worthless." This is the most worthwhile part of the book! Essentially this is his formula for developing entertaining routines that will make sense to the audience, and thereby fool them (which is the essence of Fitzkee's third book Magic by Misdirection), WHO are you? WHAT are you doing? WHY are you doing it? WHERE will you be doing it? WHEN will you be doing it? HOW will you accomplish all of the preceding? As Payne says, the single most important question you need to ask yourself when you set out to develop a trick or a routine is WHY ARE YOU DOING IT? This, he says, taught him that props must have a reason to exist. He demonstrates this by explaining the WWWWW&H of his multiplying bottles routine and his version of Martin Lewis's "Technicolor Prediction" trick. You will also like what he does with the "Television Card Frame." And his “Da Vinci Code" routine is worth the price of the book by itself!